RVing and camping are fun. If you are more into GLAMPING, well, good luck camping! One of the biggest issues with camping and RVing is keeping all of the DIRT out of your tent or RV. It doesn't matter how clean you are or how you camp, dirt and dust seem to find their way into every little crevice of space that you have. Seriously though, there are a few good ways to keep a good portion of the dirt out of your camper. An RV mat (aka outdoor rug) is your first line of defense. Here you will find out what different types of camping rugs are available, whether or not you need a camping mat, how to clean your mat, environmental considerations to think about of having a mat, and more. Do I Really Need an RV Outdoor Mat? Taking off your shoes helps keep your space clean, yes. But what if you have dogs? What about your kids? If the kids miraculously aren't inside on their phone the whole time, well, they are going to be outside playing. Getting dirty. Guests also equal more feet. More feet = more dirt. The conundrum here is that the more you have, the merrier... but also the dirtier your little house on wheels OR tent is going to get. 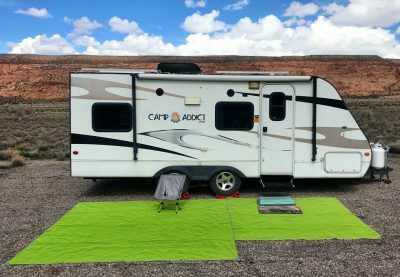 An RV patio mat will not just keep a lot of dirt out, it will also make your camping spot feel less like a box on wheels and more like an 'outdoor space'. An outdoor RV rug is also a good place to set things outside without them getting all dirty. Mats come in many sizes, shapes, and categories. 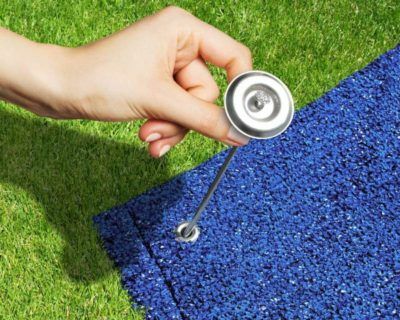 You can get a mat that 'breathes' so the grass underneath doesn't die (though long term use of any mat on top of grass will eventually do the green stuff in). You can get an RV patio mat that lets sand fall through it. You can get mats that are large enough to create a sizable and welcoming area for guests to come and sit. Mats can also make a gravel campsite easier to walk on and sit in a camping chair, as it will somewhat smooth the surface. Whatever kind of RV outdoor rug you choose, they all tend to make an area look 'put together' and inviting. It's almost like having an outdoor living room. Especially if you have your awning out and ESPECIALLY if you have a screen hanging from your awning to block the view or wind. Your outdoor area can be as fun and funky or as simple as you want it to be. The size outdoor mat you choose will have a lot to do with your camping habits. 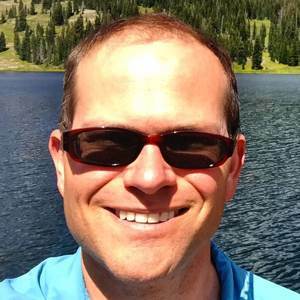 You may like to camp for prolonged periods of time. You may have a huge Class A. You may have a tiny Casita travel trailer. You may have a tent. These details matter when it comes to selecting an outdoor RV rug for your needs while camping. Before you make your choice, here are some things to consider for the size of your rig. You don't want to get a big mat or mat(s) because moving the mat, rolling it up and storing it might be too much of a hassle. Bigger, heavier rugs are better suited for those with more storage space and who are going to be doing an extended stay at their site. You should choose a lightweight, smaller RV outdoor rug that will take care of your needs just the same. 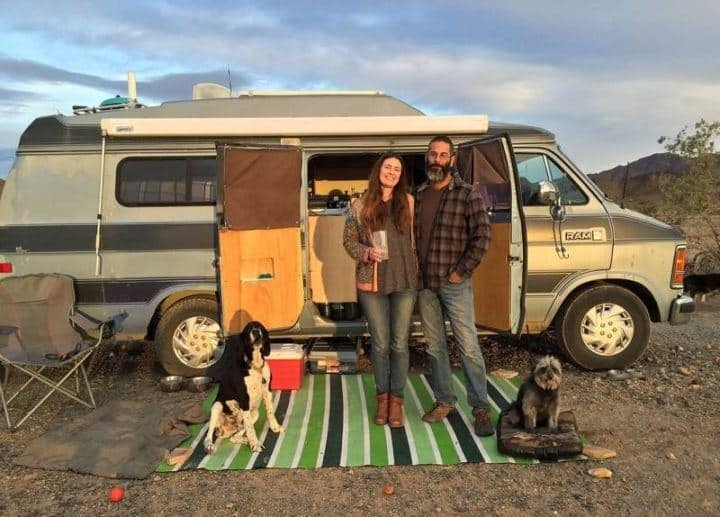 Kerry and Tim with their van and outdoor mat. Photo by Leigh Weitzel of Aluminarium. The smaller your setup is, the less likely you will have much company coming over to hang at your place. You may only need a mat for one or two chairs. Otherwise, you could choose two lightweight mats and place them side by side to create a bigger 'landing pad' for your guests when they do grace you with their company. If you have a long travel trailer, a large fifth wheel or a long Class A, then you have more real estate to play with under your awning. You likely also have more storage space to play around with. 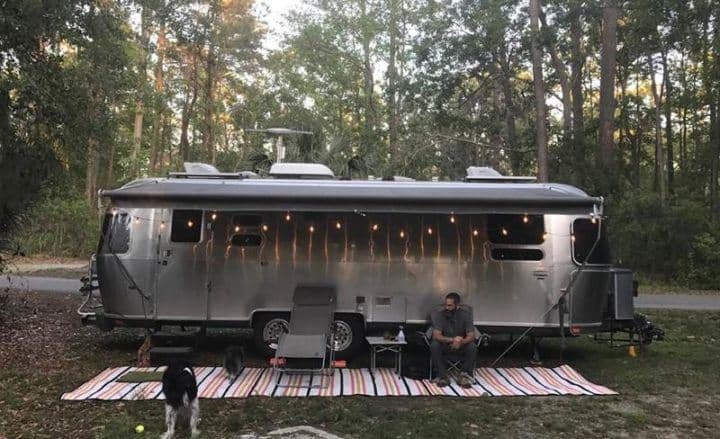 With a larger setup you also have room to make an even more cozy outdoor space such as an outdoor grill, a propane fire pit, more camping chairs, and maybe even an outdoor potluck table. If you consistently camp in the same area, say, the Pacific Northwest, think about what your needs will be for that area. If you are always staying in campgrounds with hard-packed, damp earth, then you likely won't need the sand mat. You should probably choose something that will dry out easily. Same as if you always go to a beach area and there is a lot of sand. Then, most likely, sand will be your biggest nemesis and you should get a sand mat. If you always stay at campgrounds where you are on concrete pads, your choice won't matter as much. You likely aren't fighting anything but maybe ants. 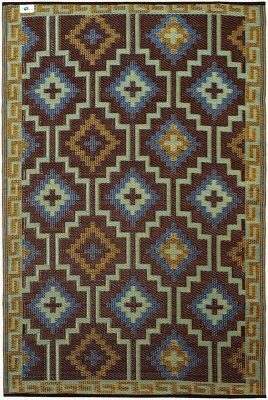 You could go for a camping rug that isn't too hard to load and unload, and one that matches the colors of your rig. If you are in a windy area, be sure you can stake your RV mat down securely. If needed, put large rocks on the outer corners so you aren't buying a new outdoor RV mat every week because your old one blew away. Some winds are even too much for stakes. If you LIVE in your RV and you stay in places for extended periods of time, you don't have to put as much emphasis on the weight of the RV rug or how easy it is to store. If you stay for long periods, and you will want something heavy duty and large to cover one big area. Moving your RV outdoor rug twice a year should not really be a big deal. You could really go with whatever you wanted- just pick something that you like. Still, best to pay attention to your environmental considerations such as mud, dust, rain, and wind and buy accordingly. If you have children or dogs, then having an outdoor mat is almost a must-have if you plan on any kind of cleanliness whatsoever. An outdoor RV mat will provide the kids with a dirt-free area to play on. Dogs can also be kept on the mat to keep their paws cleaner when letting them hang out outside. They also can take their shoes off and on while outside on the mat, effectively staying out of your way inside of your rig. AND it helps keep the dirt out. Another thing to consider with these outdoor mats is that they can be multifunctional. They can be used at your home as well as while camping. Many people use them around their pool or deck area. Screened in porches can be made to feel homier with a mat that defines a seating area or eating area. You don't have to just pack the rug away and only use it a few times per year if you don't want to. Most of the mats are mold and mildew resistant, so they should be good for damp areas like pool decks. There are different types of RV outdoor rugs to serve different purposes. Some are made to keep sand off of them, while others are made just to help not track in dirt. Most RV outdoor rugs are breathable and rain pass through so you don't kill the grass with short-term use. Nice long RV mat outside of Kerry and Tim's airstream. 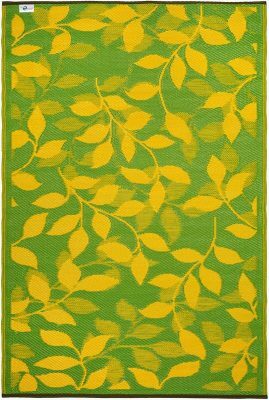 The type of camping rug you should get will simply depend on your size and your typical usage as we talked about above. Keep in mind that you may not be able to use your mat at EVERY destination. For instance, if you are boondocking in Sedona and it RAINS, well, there is nothing available on the market that can handle THAT kind of nasty mud. You will want to pick up your mat before the rain hits. Get some disposable shoe covers. Otherwise, when you step on the rug, the mud will pack onto the backside, eventually dry, and will become a huge mess to have to clean up before storing. Most people only make the mistake of keeping an RV mat out in muddy conditions ONCE. Most RVs don't have unlimited water to clean up the mess, so there's that. Besides, nobody wants to have to clean up a nasty muddy mess, wet OR dry! Best bet for mud is to get disposable plastic covers for your shoes for messy weather, and ditch the rug until things dry out. With all of that said, here are a few mat types to consider for your needs. Some time ago, the military had a need for some type of portable landing mat for helicopters that would keep sand from flying around when the helicopter landed in sandy areas. They ended up creating the CGear Multimat. It worked so well they started to market it as a beach blanket. This went well and then the camping world got introduced to the concept. The CGear Multimat is light, foldable, and compact. Sand that gets on it will fall through it. So theres never sand on top of the mat. It comes in three color choices. 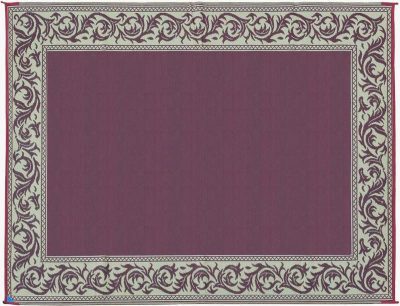 It is reversible with a different color on each side of the mat (two of the color choices). We also (personally) like that it comes in solid colors without goofy patterns or wording on it. There are also mats that allow light, water and air to pass through them. These mats are good for extended stays on grass when you don't want to kill it. Most mats allow water to pass through, but letting the light through is another thing. You may not be allowed to use an outdoor camping mat at certain campgrounds unless it allows the grass to survive an extended stay. There are a few brands that use a more open-weave design that allows light to get through to the grass. While many outdoor RV mat manufacturers state that their mats are breathable and won't damage grass, the simple truth is that if you leave something on top of grass too long, chances are it's going to do damage. Grass needs sunlight to grow. Covering grass keeps sunlight from getting to it. No sun equals unhappy grass. If you want the grass under the mat to stay green, consider moving the mat occasionally, or picking it up all together. The grass will thank you. Seriously, this is easy. If you got a true outdoor/water-safe mat, it's as easy as sweeping it off. Otherwise, if your mat gets a little muddy or dusty, a simple rinse with a water hose will do. If it's REALLY dirty, take it to a car wash (or home) and use the soap cycle with the brush to give it a good scrub. All outdoor RV mats are obviously OK to get wet as they are intended for, well, outdoor use. They can be cleaned with a simple rinse and let hang to dry. Easy peasy. He only boondocks these days, and 99% of the time he's out on public land somewhere. Dirt, gravel, grass, whatever, he never uses a mat. Camp Addict Kelly, on the other hand, has had a couple of mats. Her current mat is the CGear Sand Mat. She does NOT always use it. It stays in her RV bay 90% of the time. It all depends on how long she is going to stay parked and how messy the ground is where she is staying. With two small dogs, things can get a little messier than if it were just her, but still, much of the time she does not use the mat. It's 'too much fuss' for her. It's just easier not to get it out, set it up, and then have to keep it swept. Then of course, it has to eventually be put away. Simplicity is a beautiful thing, and sometimes Kelly keeps it that way. It's up to you whether you should get an RV mat. Some people wouldn't think of not putting theirs out. Others have never had one and have zero complaints. It's a matter of whether it benefits you enough to live with the 'hassle'. If you are in the market, we have done the market research for you with reasoning behind each decision- find out our review results below to see if the right mat for you is here. 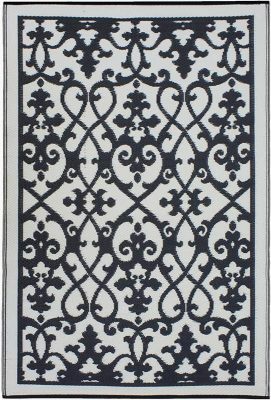 RV patio mats come in all sorts of different sizes, shapes, colors and patterns. Chances are you will find something you like in the below reviewed products. When it comes to conventional RV mats made out of woven plastic, we give Ming's Mark RV mats a slight edge over the Camco reversible outdoor mat. Both are a good product at a competitive price, but we like that Ming's Mark offers interesting designs where Camco tends towards the solid patterns. To each their own, we just prefer neat designs. You really cannot go wrong with either brand. We also review an eco-friendly RV mat that uses recycled plastic, and a mat that makes sand and dirt disappear (maybe not actually disappear as it's not magic - the review explains how it works). Read on to see which RV patio mat will fit how you camp! While many outdoor RV mat manufacturers state that their mats are breathable and won't damage grass, the simple truth is that if you leave something on top of grass too long, it's going to do damage. If you want the grass under the mat to stay green, consider moving the mat occasionally, or picking it up all together. Your grass will thank you. The Ming's Mark RV mats are quite good for both product quality and customer support. 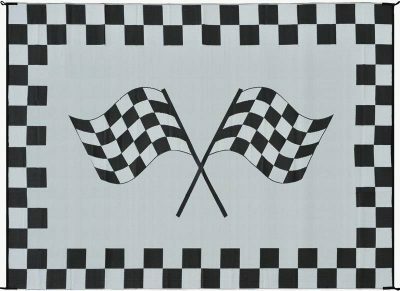 The RV patio mats are decent material, come in good sizes to choose from, and they offer many color and style combinations. 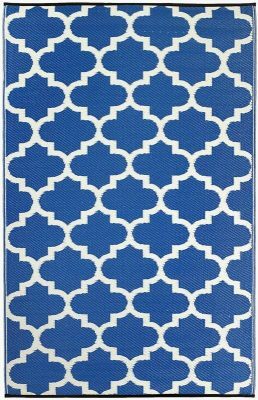 Open the 'continue reading Ming's Mark RV mats review' section directly below to see available styles and sizes of these outdoor RV rugs. Ming's Mark RV patio mats come in so many choices. They offer some silly designs, simple designs, classic designs, along with a bunch of colors to choose from. They are sold under both the Ming's Mark and the Stylish Camping brands (but no matter which brand you purchase, they offer the same features and construction). 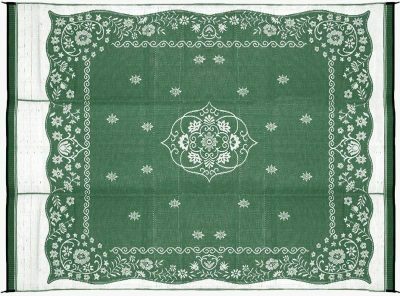 These camping rugs come in different sizes and shapes as well. 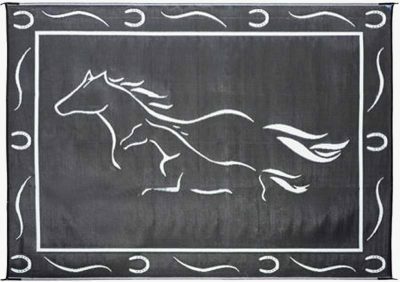 Sizes of these RV outdoor mats include (in feet) 6 x 9, 8 x 12, 8 x 16, 8 x 20, 9 x 12 and more. And hey - all of their RV mats are also reversible for those of you who get bored easily. These camping rugs are easy to clean - just clean them with a broom or hose them off with water. There are loops at each corner so that you can use stakes (not included) to secure the mat to the ground. This keeps the Ming Mark's outdoor RV mat from blowing around in the breeze and helps it maintain position while being walked on. For those of you that like to put your RV patio mat on grass, but don't want to kill the lovely green stuff, Ming's Mark claims all of their RV rugs are breathable and won't kill or damage grass. (Though if you leave the mat on top of grass too long, it may do damage since mats blocksunlight that grass needs to grow). The company has been around since 1999 and they have been making chairs and RV patio mats for most of that time period. Since then, they have broadened their product category to include camping chairs, LED lights, as well as other products for kitchen, marine, sports, and healthcare. Their longevity boasts confidence in their products. This is a good all-purpose RV outdoor rug that won't break the bank and it will look good outside of your tent or RV. We gave the edge to Ming's Mark RV mats over the Camco reversible RV mats just because we like the variety of patterns Ming's Mark offers. 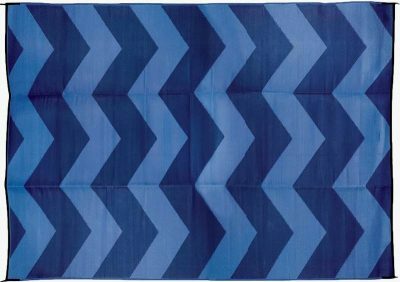 If you are more into the solid colors/patterns, then the Camco RV mat (our runner-up best RV mat) may have something you like better. Both Ming's Mark and Camco make a good quality RV patio mat at a competitive price. It really boils down to which colors and/or patterns float your boat more. If you want a simple way to keep your RV mat from flying away in strong winds, you can always use large rocks that may be lying around. If not, you may want to get some stakes to hold down your RV patio mat. Below are some inexpensive stakes that come in a pack of 4 or a pack of 6. They are very effective. We have used them in VERY high winds with no problem. 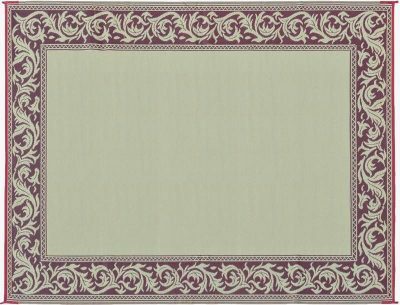 The Camco Open Air reversible outdoor mat is a good quality RV rug at a competitive price. They come in a variety of sizes and colors, but tend more towards the solid colored designs. 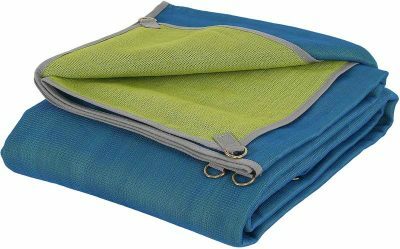 If you are looking for a basic, no frills mat for your RV's outdoor living space, the Camco Open Air reversible RV mat is a good choice. The patterns available tend towards the 'ho hum' side of things. 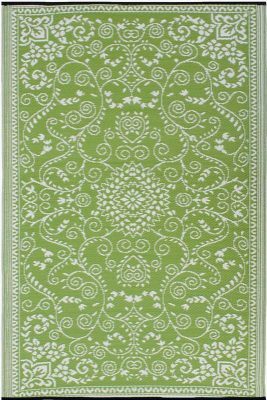 If you want some more interesting designs, consider the Ming's Mark RV mats, our top pick. 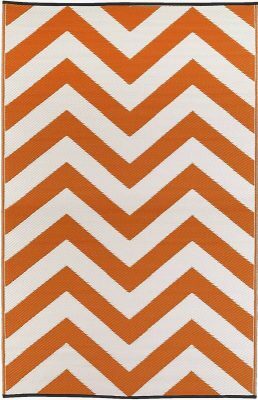 All designs are reversible, which means that you can flip the mat over and have a different look. This works better with some of the designs, but with the more solid or stripe patterns, you won't see much difference with the reverse side. 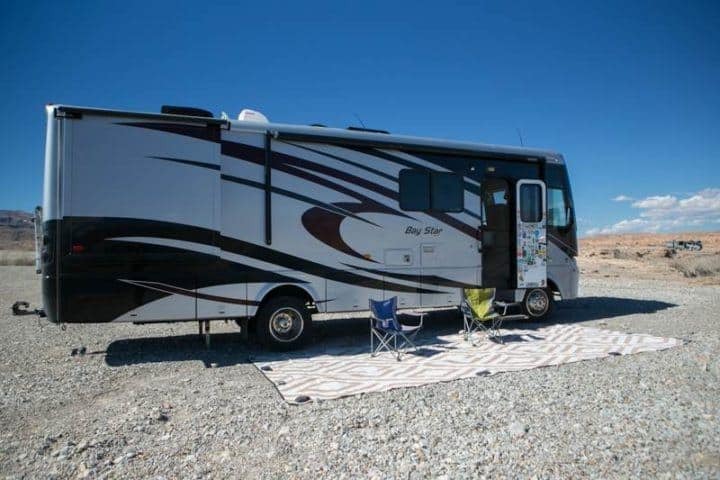 Like all of the RV mats reviewed on this page, the Camco RV outdoor mat is made from a woven plastic material that has been UV treated to limit sun damage. They are also mold and mildew resistance and quickly dry if they get wet. This lightweight outdoor RV rug is breathable so that it won't damage grass underneath with short-term use. Extended us over the same patch of grass may cause damage as grass needs sun to stay healthy, and RV mats block sunlight from reaching the grass. 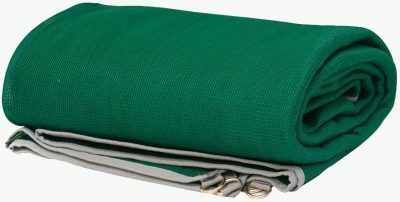 The Camco Open Air reversible RV mat has durable edging helps keep the mat from fraying, and folds easily for storage (a carry bag is not included). To clean this outdoor rug, you simply sweep it off or spray it down with a water hose. There are loops at each corner which allows you to use stakes (not included) to secure your RV outdoor mat to the ground. This prevents wind from blowing it around, and keeps it secure as you walk on it. If you want a simple way to keep your RV mat from flying away in strong winds, you can always use large rocks that may be lying around. If not, you may want to get some stakes to hold down your RV patio mat. 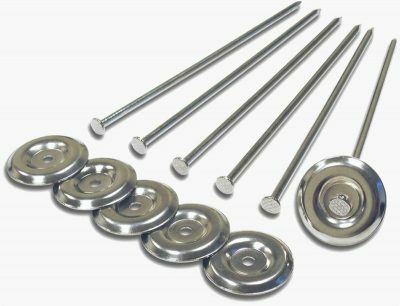 Below are some inexpensive stakes that come in a pack of 4 or a pack of 6. They are very effective. We have used them successfully in VERY high winds. 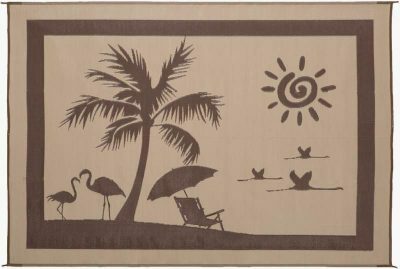 If you are into recycling/earth products, Fab Habitat RV patio mats are your jam. 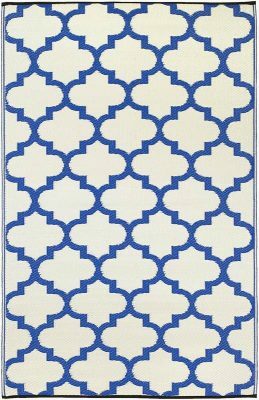 Colorful as well as mold and mildew resistant, these awesome outdoor rugs will have something to fit your individual need and taste. 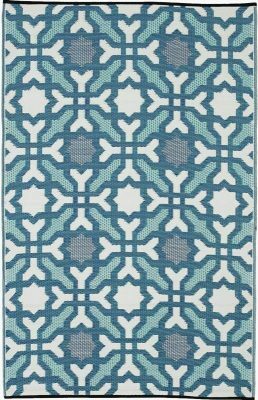 Open the 'continue reading Fab Habitat RV mats review' section directly below to see available styles and sizes of these outdoor RV rugs. Fab Habitat is committed to reducing their carbon footprint. To do this they use recycled plastics for most of their collection of RV outdoor rugs. They are committed to helping to keep plastics out of landfills as much as possible. Nothing wrong with that. 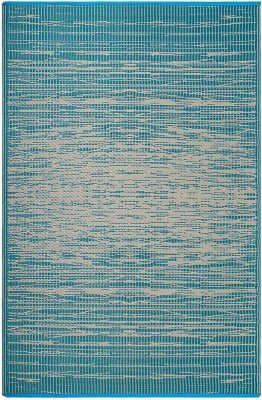 Most of the RV outdoor rugs featured below are made from recycled water bottles or straws. They are tightly woven which gives them durability, and because they are made from plastic, moisture doesn't damage them. These stain resistant, spill proof RV mats laugh when they have liquid spilled on them. They clean up easily and are both mold and mildew resistant. You can either sweep off your Fab Habitat RV rug, or hose it down with water, when it needs to be cleaned. All of their RV patio mats have been treated with a UV protective coating. This helps to help prevent sun damage so you can get outdoors or use them outdoors full time (all season use) as much as you want to without them getting old looking. 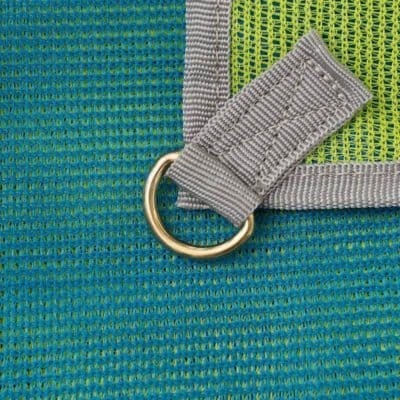 The mat's woven material is breathable so with short time use it won't damage grass you put the mat over. However, extended use of these RV mats on the same patch of grass may cause damage as grass needs sunlight to grow, and these mats block the sun. 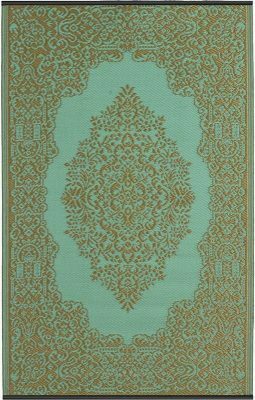 We really like the broad selection of rug colors and patterns, which are more colorful and more fun than a majority of the bland or uber cheesy RV outdoor rugs that you find. All designs are reversible, which gives you the option to switch things up at your campsite. Just flip your RV mat over and have a new look! 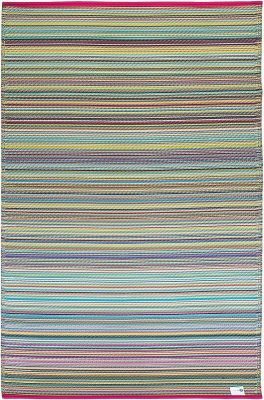 These RV outdoor rugs are made in India and are Goodweave Certified, meaning although they are handmade, no children have slaved away their childhood making them. 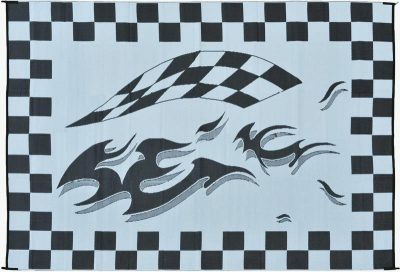 Only a couple of their RV patio mat designs come in the larger 8 foot by 10 foot size, with most designs topping out at 6 feet by 9 feet (see below for size availability for each design). This is a little limiting if you would like to have a large outdoor rug out front of your rig. 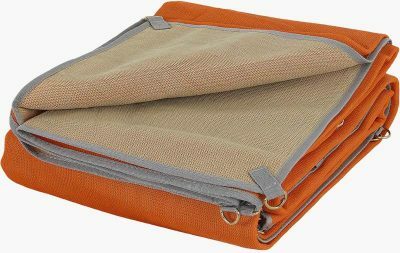 A jute carrying bag comes with some sizes, which makes it handy when it comes time to store your Fab Habitat RV patio mat. 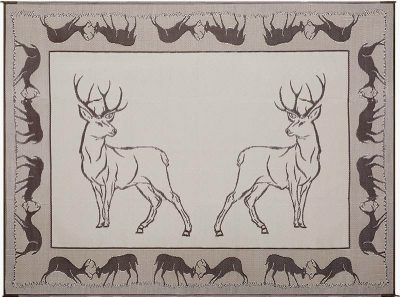 Unlike the other RV outdoor rugs reviewed on this page, the Fab Habitat RV mats do not come with a loop or ring at the corners to allow for stakes to hold them down. If wind is an issue, you will have to use rocks or some other weighted object to keep the mat from blowing around. Or simply bring it inside. If you are a supporter of Eco-worthy products, then the Fab Habitat line of recycled plastic outdoor RV mats are what you are looking for! This RV mat was originally designed by the military as a landing pad for helicopters. It allows dirt and sand to fall through it without coming back up. This keeps your RV cleaner as you are tracking in less 'stuff' from the outside. 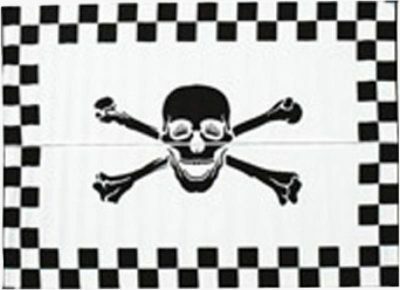 Both Camp Addict co-founders Kelly and Marshall have this RV mat. Kelly has the 8 foot by 8 foot size, while Marshall has the 10 foot by 10 foot size. Kelly got the CGear Multimat RV mat after seeing it at a friend's rig. Liking how clean it looked, and the solid color design, she had to get one after finding out that it allowed sand to fall right through it. 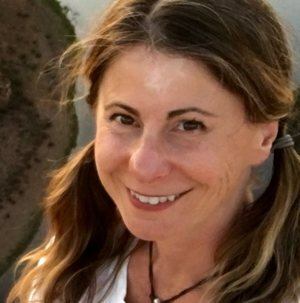 Though Kelly doesn't use it at every boondocking spot, she finds it very useful for those sandier locations where her dogs' feet, as well as her own feet, pick up a ton of mess. The CGearMultimat is made of two different layers of a weaved material. This material allows for sand and dirt to fall through (in one direction) but not come back up. The video below demonstrates this unique, and very impressive, material. This multipurpose outdoor RV mat can be used as a mat (duh! ), but you can also use it as a sunshade. When used as a shade, it blocks 91% of the suns rays. You can even take it to the beach with you and give yourself a sand-free place to kick back. Construction is impressive. The edges are neat and very sturdy. Can't imagine anything coming unraveled. Oh, and if you get a hole in it, it's not going to run the length of the mat as these RV mats are made from ripstop material. There are D-rings at each corner so that you can stake the CGear Multimat into soft ground (stakes not included). This keeps it from flapping in a stiff wind, and helps keep the mat in place with use. 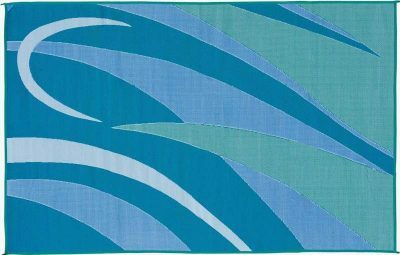 This durable, versatile RV patio mat comes in different colors (green/green, blue/lime, orange/tan) and is reversible, so you can have a different colored mat depending on your mood. Whether you are a weekend camper or a full-time RVer, having an outdoor RV mat can be a wonderful thing. It can create an inviting area for you and guests to come and hang out by the campfire. It can help to keep the inside of your RV cleaner. Camping rugs can keep the dust down at your campsite. It can also make it seem like you have an extra outdoor room. Whatever your reason for getting an outdoor mat, you should enjoy your time while you are 'out there', using it. If you want to get an RV mat, get one! It just might be your favorite new 'gathering spot'. I checked with Kerri and she said she purchased it from Target a few years ago. Probably a season item. And may not be available these days, cuz, you know, fashion trends. 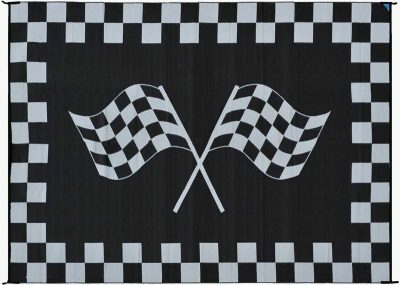 Best of luck finding your perfect RV mat! 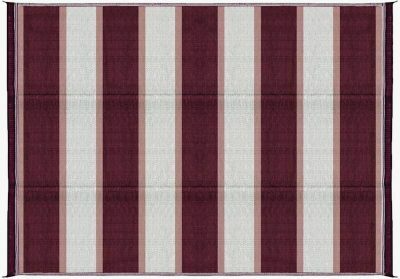 I’m looking for large patio mats with a college logo for our travel trailer. The awning is quite large… approximately 8′ x 18′. I need something really sturdy…not a canvas type…but one that won’t blow up if it’s windy. Any idea where I can find such a thing?? We have found mats of that size, but not with a college logo printed on it. Any mat that large can and probably will blow up if it’s windy. They act like a large sail. Out west, where it can get windy often, people usually put their mat away if they know it’s going to be windy. Same with awnings… they are a big sail. If it’s even a little windy, best to be safe and put the awning in. I’ve been using one of these mats for the past year or so. The mat itself is great: tough, indestructible. But the binding around the edges, and the straps that hold the D rings on are not UV resistant and have disintegrated. Spent a day sewing on new straps for the D rings by hand, not having a sewing machine in my trailer! Which mat are you referring to (we review several on this page)? And how often do you have the mat outside? Do you leave it out year round?